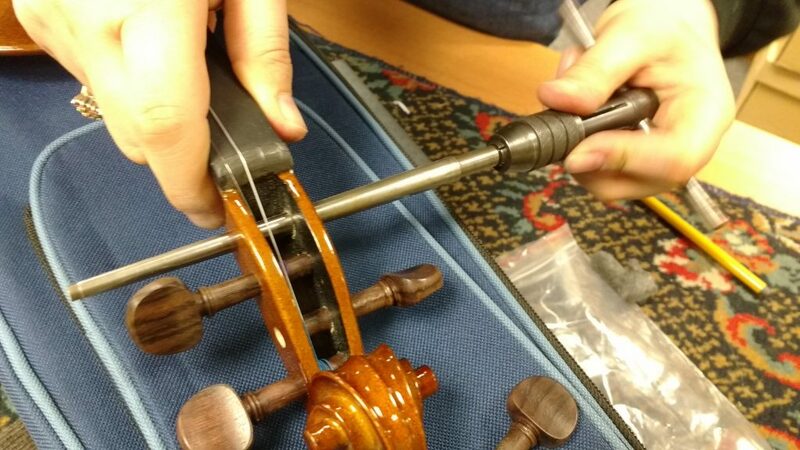 Our workshop checks every instrument before it leaves us. For many people the cost of learning a new instrument alone is enough to put them off. There are many cheap instruments available but a huge number of pitfalls you can encounter. Surely there has to be a better way? We think we have offered the best of both worlds with our “Pure Rental” scheme. Too often we come across people who have bought cheap instruments online which simply are not fit for purpose. Sometimes these ‘budget’ instruments are hard for a professional to play, let alone a young beginner. I can’t help but think this is the perfect way to discourage a child from learning music, as those early experiences with instrumental playing can be vital for building confidence. A lot of the time these cheap instruments are offered to us as the learner has given up after a couple of months, which is little surprise. You then have 3 months to try it out: most people will know if it’s something they want to pursue within that time. If it turns out you’re not finding it as enjoyable as you thought, it’s just a case of returning it to us, without the expense of purchasing an instrument and the hassle of finding somewhere to store it or sell it on. On the other hand if your 3 months are promising and you know this is something you’ll enjoy you can purchase the instrument and get your first rental payment off the purchase price (e.g. £24 off a violin.) This is the most cost effective way of buying an instrument from us. If you’re undecided that’s not a problem either, the rental scheme runs on a rolling monthly contract with a 2 week notice period. You can return the instrument at any time, or if you want to purchase later you can claim 50% of what you have paid on the rental against the price of any upgrade instrument of the same type. If you rent a student flute, clarinet or trumpet for a year you’d build up £72 of rental credit against purchase. We’ve had several success stories of children starting on small size instruments (1/10 size cello for example) and sticking with our rental scheme, swapping over each different size when required, and building up enough in rental credit to upgrade to a hand-crafted German made instrument once they reached full size. At Ackerman Music we’re proud to promote this scheme, to give as many people as possible a chance to try a musical instrument. We run the scheme nationwide* and are always overjoyed when we can be a part of starting someone’s musical journey.For more information please visit: http://www.ackermanmusic.co.uk/instrument-rental where you can see all the instruments we have on offer, and fill in a rental application form.